If you’re not familiar with me, you probably don’t know how much I love graphic novels – for myself, for my students, for anyone really. What you may not know is the crazy wide variety that is out there. When I began my Library Media Specialist job two years ago, the first thing I saw was a lack of graphic novels. I began to remedy that. I’ve been a big supporter of graphic novels, especially for the struggling reader, when I began the last two years of my undergraduate degree in Elementary Education. I was working at a public library at the time and ended up raiding their graphic novels and other libraries to find what was out there for kids these days. Some major things that I look for when I’m purchasing graphic novels is the age-appropriateness for my elementary school. I have not purchased any Manga – the Japanese form of graphic novels that are gaining popularity every day – because they can be randomly inappropriate for my 2nd – 5th graders. So what do I buy? Here are some series that I’ve bought that do not stay on the shelf – ever. Both my male and female students cannot resist the awesomeness that is Babymouse. I have 2 copies of each of the 13 volumes and I’m lucky if there’s more than one the shelf at the same time. This follows a mouse named Babymouse as she daydreams through school. The whole graphic novel is colored in only black, white, and pink. She loves pink cupcakes and her daydreams go from being a rock star to even a race car driver. 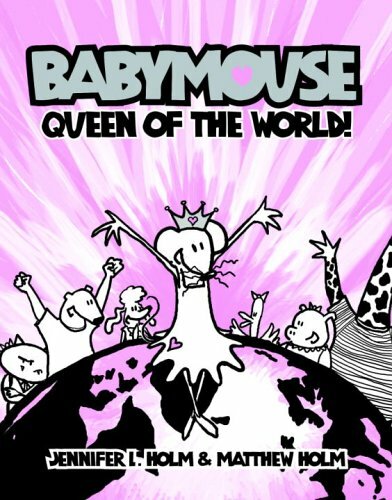 I had the good fortunate of meeting the siblings who write this fantastic graphic novel series at ALA two years ago and they were as fun as Babymouse herself. 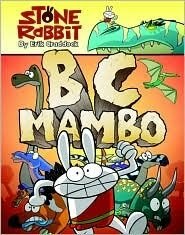 This series is about a rabbit who lives in a boring town and somehow manages to go on all sorts of crazy adventures – from a Jurassic journey to pirates and even outer space. This is a great series for those struggling boy readers who need something fun to read. Fashion Kitty is a series about a kitty named Kiki who turns into Fashion Kitty whenever there is a fashion crisis about to happen. She swoops in and saves the day and makes everyone happy! She can even fly! This series is a huge hit with my girls. And there’s so many more out there, but those are some of the big hits with my students. I’ll probably talk about nonfiction graphic novels some other time – there’s so much I could talk about graphic novels! They really are fantastic. 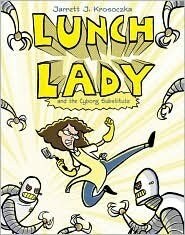 Here’s a great article about Graphic Novels for (Really) Young Readers from School Library Journal. They also touch on some of the other graphic novels that I have in my library. What do you guys think about graphic novels? I, myself, am not a big fan because I tend to be more verbal than visual. My husband, sister and future brother in law, however, are much more, ahem, animated, when it come to such things. I’ve always been interested in their interest in the genre but I still just can’t find my own love of it. Love reading your post about them, though!